I chose to get the Grilled Tilapia seasoned with Boneheads' Spice. You can choose a topping and I chose their Pineapple Salsa. It comes with their Seasoned Rice and I chose French Fries. I thought the fish was super bland and flavorless. Personally I would rather go to California Fish Grill where they do the natural flavor right. A simple garlic butter would do. I couldn't taste any seasoning or flavor and even the salsa couldn't help. The whole time I was sitting there I thought to myself.... I am not coming back... Oh well at least I could take it home and make someone else eat it because I am not shoving that down, it's a waste of space. The fish wasn't overcooked or anything but it just really needed more. You couldn't even taste the natural flavor of the tilapia. =*( I think I am done with this place and I am making a note here so that I will remember not to succumb to laziness. CVS Pharmacy : Still Getting Carded? Okay, I can't believe that I got carded for buying Nyquil. I haven't been sick for a while or at least not sick enough to need Nyquil so I never knew about all these new laws or rules. After being sick for over a week and not getting any better with Contact pills, I decided that I had to get some Nyquil and Afrin to aid my recovery. Even though I had my mother next to me at the cashier, the man asked for my ID. I was taken aback because I was only buying ONE bottle of Nyquil and ONE Afrin. Apparently I either look under 18 ... which many might be flattered, but no thanks ... or I look like a druggie who is going to use the dextromethorphan for personal use. It couldn't be that I was using it because I was sick and dying, which I probably looked like or sounded like. I learned something new that night and just thought this was funny, for me that is. At least we know that these stores are trying to stop teenage drug abuse? I guess I haven't been a teen for a while so I didn't even know what they do to get a fix these days nor did I know that such a problem existed... lol Now I know! Another great event coming up! 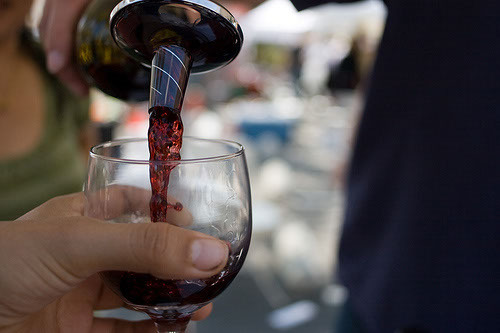 Be sure to buy tickets ahead of time to enjoy a day out in LA with fine wine and food. It will be a wonderful experience! ^_^ Special thanks to Pleasure Palate for the heads up! 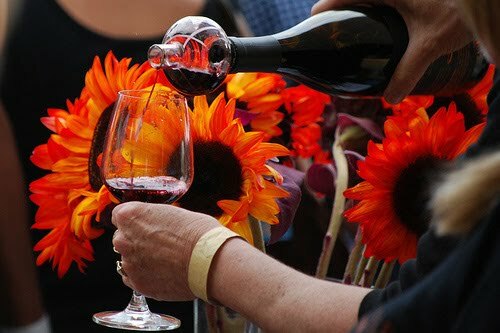 Description : More than 130 wineries, spirits and thirst-quenching craft beers, great food, and over 30 lifestyle vendors, this is a weekend you will not want to miss! Sample over 500 different wines from at least 14 different countries. Meet and greet with LA’s top Master Sommeliers, wine educators, winery owners and vendors, and enjoy food from LA’s top restaurants. For starters, I ordered the Chicken Wings to try out. They were a little different from what I expected. I wished that they had more flavor and pizazz. They were small wings served with celery and carrot sticks. You can order any combo of seafood. The choices were Crawfish, Shrimp, Snow Crab, King Crab, Clams, and Mussels. 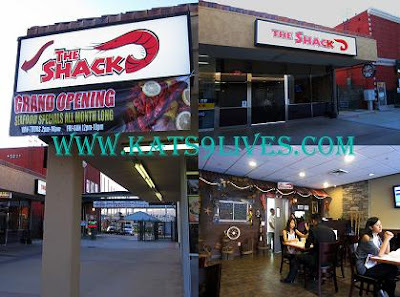 We chose to get 1 lb of the Crawfish with the Medium Shack Special Sauce and 2 lbs of Shrimp with the Mild Shack Special Sauce. With our order you get a Corn and Potatoes. I added Sausages and more Corn. What is something new that I haven't tried up in SF and a little different from the usual. I saw reviews about So, a Korean place that is supposedly known for their wings. As soon as I saw the word wings, I marked them down as a must try. Finally I was able to go with Ms. Lin and Trekkie for a between meal snack. O=9 The location was a little bit hard to spot because only the windows are painted with the name So and the sign above the place still had the old Chinese restaurant name displayed. 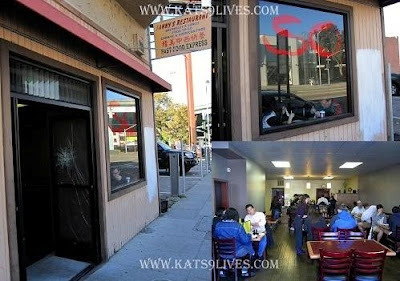 Only when I did the photo editing did I see that the door was cracked all the way... hmmmm... That aside, it is all about the food and not necessarily the locale or outer decor. Since we went between lunch and dinner there wasn't much of a wait and we were seated immediately. Through the window we saw this couple eating a hot bowl of spicy ramen and since it was cold, Ms. Lin and Trekkie were very into trying out. We found out it was on the Spicy Soup Noodles section and ordered the Spicy Combination. It includes stir-fried Shrimp, Calamari, Mussels, Beef and Mixed Vegetables. On paper it sounded good and looked appetizing through the window on a cold day in SF. The bowl was massive and filled with ramen. As for taste... packaged ramen is much better tasting than this. The portion for $7.00 was not bad, but they missed the mark in taste and flavor. It was spicy but that was about it. One order can feed a party of 5 or more if you plan to order the other dishes. I came here solely for the Wings! How can I deny myself some Korean Fried Chicken Wings! ^_^ After founding this close location I had to make my way here. The wings are deep fried in a light better and then tossed with Roasted Red Pepper, Garlic, Ginger, and Soy Sauce. I like how Korean wings always have a slight sweetness. It had a good amount of pepper flavor that made the wings popped. They were pipin' hot and fun to eat. I only wished that they pulled more of the chicken hairs off because they were long and clearly visible, but of course you can just bite it off. This was probably the most flavorful thing here. People online recommended the So Black Bean Sauce Noodles and the thought of a potent noodle dish full of black bean flavor sounded fun to try out. Maybe I had too high of an expectation but this also fell flat. The noodles didn't really have any black bean flavor. The description said that the noodles are mixed in Black Bean Sauce, Pork, Scrambled Eggs, Jalapeños, Cayenne, and Paprika but we were given a gelatinous mess. Everything was stuck together in a glossy glue substance and the noodles weren't much more flavorful than regular soy sauce. All in all I would say stick to the wings. The people there were nice and as time went on it got busier and people were waiting outside. I thought the wings were not bad but nothing else really hit the spot. Albeit, maybe I was too full for the day but I will also argue that good food can always be felt or even make one hungry again. O=) The price and portions are very reasonable and I could see people coming here if they just want a simple meal. No fuss, no muss. After a full meal of breakfast and the beginning of lunch at Cafe Versailles, I headed out to my "second lunch" destination. Ms. Lin had done a bunch of research of what to do while I was on Calle Ocho and of course the list was mainly composed of food destinations. Even though I was really stuffed, I forced myself to walk over to La Carreta. It is actually really really close by and I read somewhere that it is the same owner as Cafe Versailles. The main difference is that La Carreta is more like Cuban home cooking than Cafe Versailles. They also have an outside area for coffee drinkers. Inside there is also a diner style bar for customers to sit and eat. The servers here don't speak a lot of English but they are super friendly. I can see why they say it is more like Cuban home cooking because you get the cozy and warm feeling of being in a local place close to home. While browsing the menu I found an intriguing item. They had a few choices in flavors for the batidos. I saw they had a flavor called, "Mamey". This definitely caught my eye and I tried to ask them what kind of flavor is mamey. All I got in response was that this is a fruit... I did the smart thing that anyone would do. I pulled out my phone and looked it up! "They are grown in Mexico, the Caribbeans, and South Florida. The fruit's flavor is variously described as a combination of pumpkin, sweet potato, and maraschino cherries with the texture of an avocado. Some consider the fruit to be an aphrodisiac. The brown skin has a texture somewhere between sandpaper and the fuzz on a peach." Another name for Mamey is Sapote, this new knowledge actually came in handy later in the day. To me it tasted like a mixture of fruits too. The texture was reminiscent of avocado mixed with the grittiness of a guava. This was a very thick and rich drink. It was very sweet and I had a lot of fun trying to decipher what this fruit reminds me of. There was just too many things to choose from on the menu. They all looked so good! I asked the server what she recommended and she pointed out a few items. The Criollo caught my eye because it was a huge sampler for a good price. I get to try a bunch of new things and get to kill two birds with one stone. The Criollo included Fried Pork Chunks, Shredded Beef in Creole Sauce, Tamale, Ham Croquette, Sweet Plantains, Yucca, Yellow Rice, and Black Beans. I thought the fried pork chunks were succulent and flavorful. The ham croquette was simply divine! I was looking on the menu to see if I can just order a huge batch for takeout. They were super savory and melted in my mouth with a delightful crisp outer crust. The yucca was nicely cooked and went well with everything. I really enjoyed the coffee at Cafe Versailles so I thought I should end the meal off with a bang and get another cup of coffee. Unfortunately something got lost in translation and I ended up getting a regular cup of coffee and milk. It was watery and bland. I was really let down but I think that was partly my fault since we failed to communicate with each other. Later on before I left, I got two orders of just Cuban coffee for takeout and they were fine. I made sure not to order the same thing I had earlier. 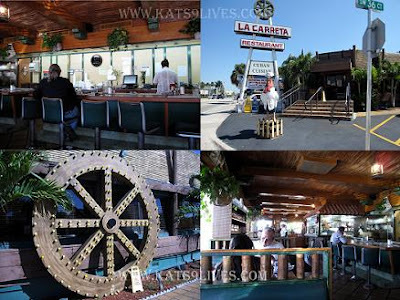 All in all I really enjoyed La Carreta and I loved the variety of food I got to try. The service was much more attentive and the people were very friendly. It was a nice finish to my day on Calle Ocho, of course there was something in between that I have yet to publish. O=9 If I ever make it back to Miami, I am definitely hitting this place up again and trying out more of the different dishes that they offer. 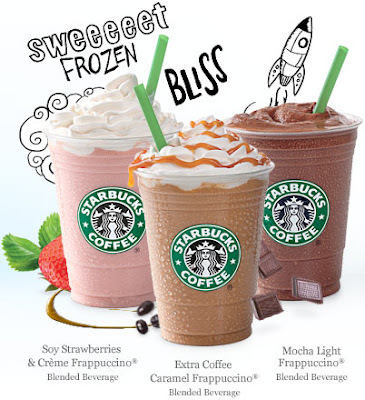 For those of you who have not seen the national advertisement on TV, it is Happy Hour week at all Starbucks! It started May 7th and will end May 16th. Happy Hour is from 3-5 PM everyday for that duration. All Frappucinos are half off. I have only had it at the South Coast Plaza location so far and it was more on the watery side, but still good. Not sure if all locations are like this, but it's still enjoyable. =) Enjoy the deal while you can! Although with McDonald's new Frappe out, I am sure this wont be the last of the deals. Also a reminder that Häagen-Dazs offering a free scoop on May 18th. Be sure to check with your local store for the correct time. I believe the one at Mission Viejo Mall is from 4-8 PM. Growing up in So Cal all my life has given me the wonderful opportunity to have delicious and as close to as authentic Mexican food outside of Mexico as possible. I don't know if Cafe Río would really be considered super authentic and definitely not a mom and pop shop, but to my surprise I actually really liked what I got. For the longest time I saw the corner of Rockfield and El Toro of a store under construction and bright vans with the Cafe Río logo parked there. It finally opened up recently and I had wanted to check it out since it seems like a pretty big space with vibrant colors. They had been in the back of my mind for a while but I haven't been in a Mexican food mood until recently when the age old question of where to eat came up again with MBA. 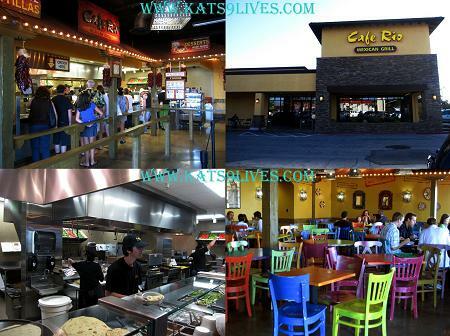 I gave her the choices of Thai or Mexican and she chose to try out Cafe Río since it was new. When I walked in, I was a little hesitant to find that it is a chain restaurant and resembled Chipotle. The food is mostly already prepared and the food is made in an assembly line. 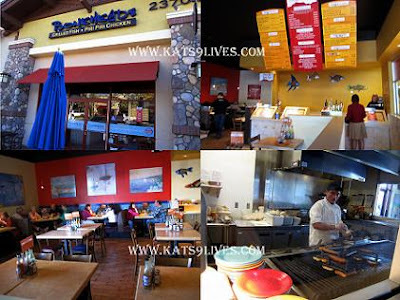 I felt like I was in Rubios almost with a few touches of other chain restaurants for the decor. Still, I was already there and had to try out the food. While we were in line I saw that they offered fresh made tortillas and there was a lady making them right in front of us. I had to video tape this down. The fresh tortillas looked yummy and were pretty tasty, but I am jumping ahead. There were signs posted everywhere talking about the supposed famous Cafe Río Salad with Pork Barbacoa. I was taking a big risk since I just had salad for lunch and I am not easy to please when I have to ingest healthy food. O=9 To my surprise the salad was actually full of flavor and had a lot of bite to it. The salad comes in a large fresh Flour Tortilla that's toasted with Mexican Cheeses. They start off by putting Rice in. Then they start adding Pork Barbacoa, followed by tons of Crisp Romaine Lettuce, a few scoops of Pico de Gallo, a small scoop of Guacamole, Tortilla Strips, sprinkles a little bit of Cotija Cheese, Cilantro, and finished off by adding a slice of lime in. I opted out of the beans because I detest beans, but asked for it on the side so that MBA could enjoy them. You get a choice between Pinto and Black Beans. For the dressing you can choose between Creamy Tomatillo or Cilantro-Lime Vinaigrette. The lady recommended the creamy tomatillo, which was very rich and flavorful. I would only recommend those who like sweet dishes to try the pork barbacoa because it is pretty sweet but full of flavor. It is like your typical carnita but sweet. All the components come together like a party in your mouth. There is a touch of citrus with a huge chunk of sweet, but all of it is balanced and toned down by the lettuce. The crispy tortilla chips and lettuce add a crunch and bite to the palate along with the soft tortilla that is flavorful by itself. Everything in the dish worked together. Even without the dressing they all exploded in flavor, but adding the creamy tomatillo helped take it to a new level. I am sure that dressing is super unhealthy because it was tasty by itself. While I was paying, I saw that they offered Fresh Fruit Frescas, Agua Frescas. 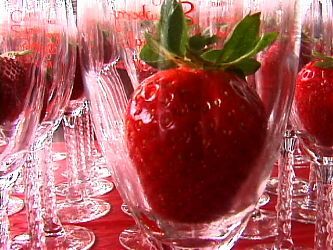 I was so excited by the prospect because I had the best Strawberry Fresca in SF recently, which I will post soon. Ever since then I had been dreaming and thinking about when I can get something that good again and cheap too! Here it wasn't cheap nor pricey, $2.50 a cup. That day they had Papaya Mango Fresca so I thought to myself that you can't go wrong with that mix of flavors. Alas it was not what I had imagined it to be. The drink was fine but I didn't think it tasted anything like papaya or barely had any mango flavor. It tasted like a sour lemonade mixed with pineapple juice. I even left it out for the night and it went even more sour which really brought out the pineapple flavor. Even though I wasn't impressed by the drink this time around, I will probably try them again if they have another appealing flavor. Another item that caught my eye was Cafe Río's Famous Tres Leches. One of my favorite new desserts these days is tres leches. I have been eating it from CA to FL these days. Mmm Mmm Good! How is it here? Mehhh. Not bad but nothing to write home about. The outer layer was moist but the inner layer was a bit flavorless and a lot drier. For $3.50 I can get better cake elsewhere, but if you are here already for the meal it would not be bad to add this on. They asked if I wanted whipped cream and I said yes, but then they said they were out... lame! All in all I was quite surprised at how good that salad was and MBA really enjoyed it too. My biggest issue with this place is that it is poorly run. The people were friendly but some seemed like they didn't know what they were doing. Also, the food is served pretty fast because everything is pre-made. So why the long line?? Well, they only have one slow person working the cash register when they have TWO registers. All their people are busy doing the food but no one is there to take the money! Even when pick-up orders come they are rung up by the same register, which pushes back the customers waiting in line already. Not a very solid plan, but hopefully they will fix that snafu and run more smoothly. Still, I liked the salad enough to overlook all this and will be back soon to take the family.